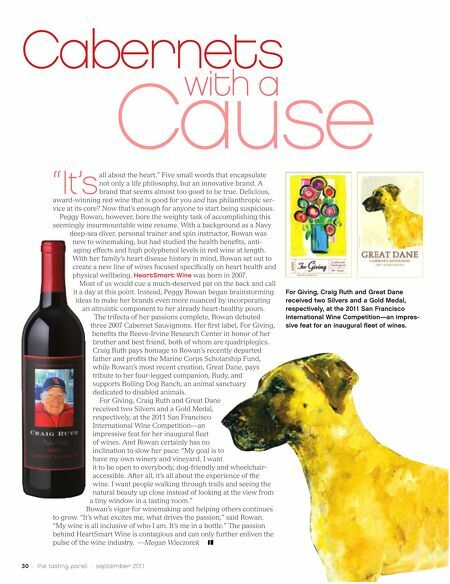 Cabernets award-winning red wine that is good for you and has philanthropic ser- vice at its core? Now that's enough for anyone to start being suspicious. Peggy Rowan, however, bore the weighty task of accomplishing this seemingly insurmountable wine resume. With a background as a Navy deep-sea diver, personal trainer and spin instructor, Rowan was new to winemaking, but had studied the health benefits, anti- aging effects and high polyphenol levels in red wine at length. With her family's heart disease history in mind, Rowan set out to create a new line of wines focused specifically on heart health and physical wellbeing. HeartSmart Wine was born in 2007. Most of us would cue a much-deserved pat on the back and call it a day at this point. Instead, Peggy Rowan began brainstorming ideas to make her brands even more nuanced by incorporating an altruistic component to her already heart-healthy pours. The trifecta of her passions complete, Rowan debuted three 2007 Cabernet Sauvignons. Her first label, For Giving, benefits the Reeve-Irvine Research Center in honor of her brother and best friend, both of whom are quadriplegics. Craig Ruth pays homage to Rowan's recently departed father and profits the Marine Corps Scholarship Fund, while Rowan's most recent creation, Great Dane, pays tribute to her four-legged companion, Rudy, and supports Rolling Dog Ranch, an animal sanctuary dedicated to disabled animals. For Giving, Craig Ruth and Great Dane received two Silvers and a Gold Medal, respectively, at the 2011 San Francisco International Wine Competition—an impressive feat for her inaugural fleet of wines. And Rowan certainly has no inclination to slow her pace: "My goal is to have my own winery and vineyard. I want it to be open to everybody, dog-friendly and wheelchair- accessible. After all, it's all about the experience of the wine. I want people walking through trails and seeing the natural beauty up close instead of looking at the view from a tiny window in a tasting room." Rowan's vigor for winemaking and helping others continues "It's to grow. "It's what excites me, what drives the passion," said Rowan. 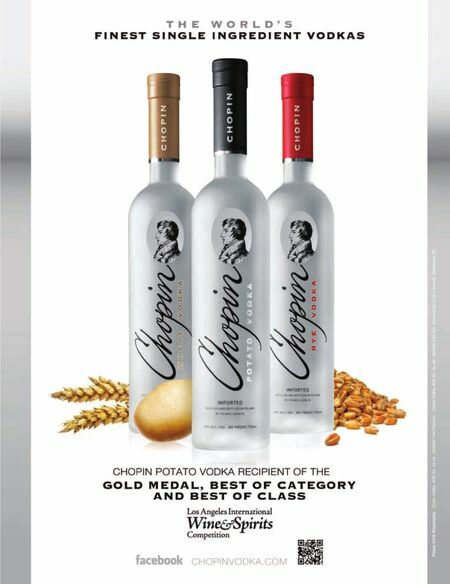 "My wine is all inclusive of who I am. It's me in a bottle." The passion behind HeartSmart Wine is contagious and can only further enliven the pulse of the wine industry. —Megan Wieczorek 0 / the tasting panel / september 201 1 Cause with a all about the heart." Five small words that encapsulate not only a life philosophy, but an innovative brand. A brand that seems almost too good to be true. Delicious, For Giving, Craig Ruth and Great Dane received two Silvers and a Gold Medal, respectively, at the 2011 San Francisco International Wine Competition—an impres- sive feat for an inaugural fleet of wines.